A potted lemon tree can thrive for many years when it is watered well, left to drain completely and placed in sunshine during the day. 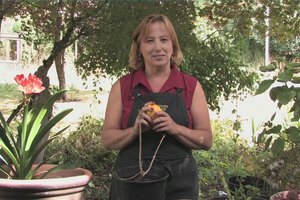 Keep a lemon tree indoors or in a green house for the winter with helpful information from a sustainable gardener in this free video on growing plants. Hi this is Yolanda Vanveen and in this segment we are going to talk about how to care for a potted lemon tree. Now lemon trees grow naturally in warm climates and they do not like to go below 50 degrees or even a little warmer than that, they want to stay warm all the time, but if you live in a colder climate you can still grow them really easily and lemons are really rewarding because once you have them growing in the container you can enjoy the fruits for many years as long as it never freezes. So you can start a lemon by seed but it is sometimes hard to take and it will take years to develop into a root or you can take a start off of another plant or a graft or a lot of times you can just buy them by root and you can even take a stalk from another lemon tree and set it in water and many times it will grow roots. It doesn't always work but sometimes you can get it to do that. Now once you have a start and you have got some roots developing then you want to put it into a pot. 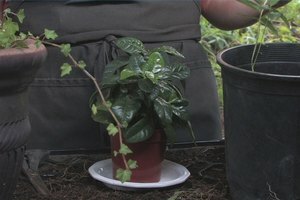 Now you want to make sure the roots are covered but like any other tree you don't want to cover the bottom with too much soil because it will suffocate it so you just want to cover it to the top of the root line and I like to use really good composted soil, aged soil, anything with really good drainage. You have got to remember with your potted lemon trees never to let it sit in water because the roots will rot and you'll lose it but at the same time you don't want to let it dry out too much because then it will dry out and you'll lose it so the trick is to just recreate nature, water it really well, let it drain really well, let it dry out to the point it is almost wilting and then soak it again and then that way it will stay lush and do really well and product lots of fruits. So even a lot of times if you've got a tree and it's not performing very well if you just stress it out a little bit by drying it out, not killing it, just dry it out a little bit, a lot of times it will trick it into producing more fruit. Now you have got to make sure and give it enough sun. If you live inland in a really hot hot climate you probably want to give it afternoon shade. If you live near the beach or in a milder climate you want to keep them as warm as possible so keep them in really intense sun. Now you can let them go dormant in the Winter, you can just throw them in the garage, let them lose the leaves and you have still got the tree and it will come back again when you put it out in the Spring or you can throw it in a greenhouse or even in the house as a house plant but even if you lose the leaves on them, a lot of times just by trimming it back about one third it will grow back again and you'll get lots more lemons. So it doesn't matter if you have got Meyer's Lemons or any other type of lemons, lemons are always a great addition to your house garden or your outside garden.